38 TOBACCO INTERNATIONAL MARCH 2016 U.S. 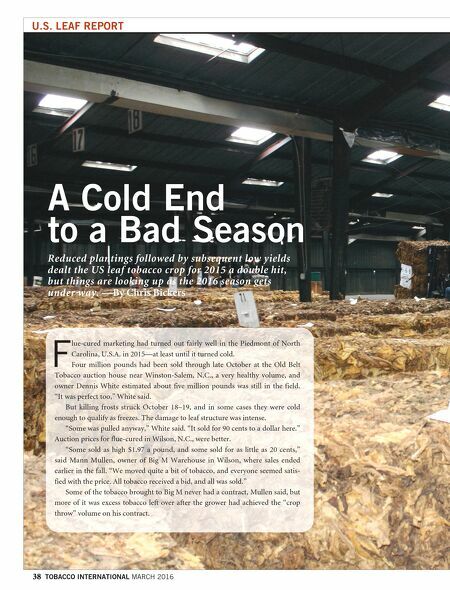 LEAF REPORT Reduced plantings followed by subsequent low yields dealt the US leaf tobacco crop for 2015 a double hit, but things are looking up as the 2016 season gets under way. —By Chris Bickers A Cold End to a Bad Season F lue-cured marketing had turned out fairly well in the Piedmont of North Carolina, U.S.A. in 2015—at least until it turned cold. 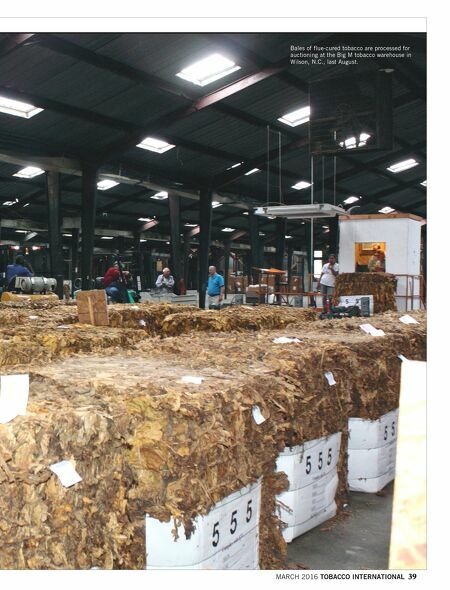 Four million pounds had been sold through late October at the Old Belt Tobacco auction house near Winston-Salem, N.C., a very healthy volume, and owner Dennis White estimated about five million pounds was still in the field. "It was perfect too," White said. But killing frosts struck October 18–19, and in some cases they were cold enough to qualify as freezes. The damage to leaf structure was intense. "Some was pulled anyway," White said. "It sold for 90 cents to a dollar here." Auction prices for flue-cured in Wilson, N.C., were better. "Some sold as high $1.97 a pound, and some sold for as little as 20 cents," said Mann Mullen, owner of Big M Warehouse in Wilson, where sales ended earlier in the fall. "We moved quite a bit of tobacco, and everyone seemed satis- fied with the price. All tobacco received a bid, and all was sold." Some of the tobacco brought to Big M never had a contract, Mullen said, but more of it was excess tobacco left over after the grower had achieved the "crop throw" volume on his contract.